From Baltimore Trump voters, what message? Coming out of the Hatton Senior Center, a polling place with a terrific view of Baltimore’s booming waterfront, voters Wayne and Robin Wooden were giddy. 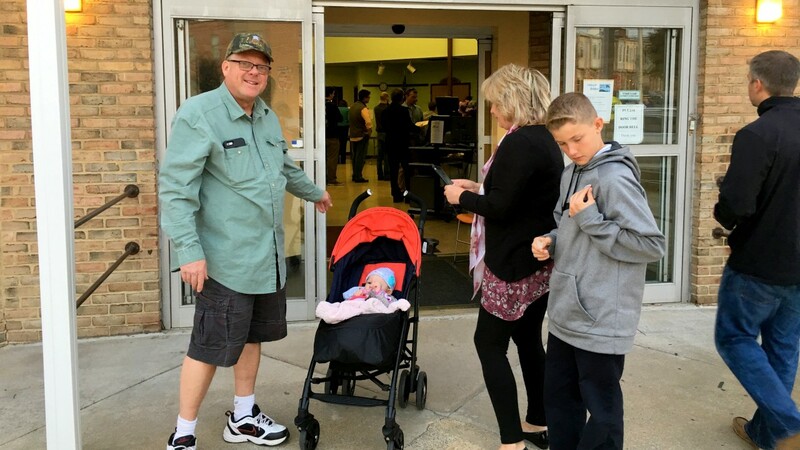 They had just cast their votes for candidates up and down the 2016 general election ballot, including Democrat Catherine E. Pugh for mayor and Republican Donald Trump for president. Asked what it was that attracted them to Trump, who, as the world now knows, went on to capture the White House in a stunning upset victory last night, Robin Wooden answered without pause. And he didn’t stand a chance in deep blue Maryland, which Hillary Clinton carried with 60% of the vote, to Trump’s 35%. But the rest of the country – whether voting in support of Trump or to repudiate Clinton or something she represented as a Democrat – narrowly joined the Wootens. How did the “thrice-married Manhattanite who lives in a marble-wrapped three-story penthouse apartment on Fifth Avenue,” as the New York Times described Trump this morning, wind up as the personification of a voting block that often styles itself as a populist revolt? How did the billionaire businessman, who never specifically repudiated Clinton’s claim that his tax cuts would benefit the top 1% of America, galvanize white, non-college-educated, over-45 Americans to his side? Democratic Party leadership (including Baltimore’s own outgoing mayor, Stephanie Rawlings-Blake, secretary of the Democratic National Committee) as well as the news media, pollsters and the financial markets will be pressed to look hard at how they missed this sea change in the electorate. Among the data points that will be deconstructed are the ones that showed Clinton has something in common with Al Gore in 2000 – winning the populace, but losing in the Electoral College. This morning it appears that Trump, who passed the 270 electoral vote threshold in the wee hours of the morning with a victory in Wisconsin, apparently lost the popular vote by a razor-thing margin. That’s cold comfort to Trump’s opponents. On the Republican’s coattails, the U.S. Senate remained in GOP control and the House of Representatives is already theirs. Trump’s promise is to appoint conservatives to the Supreme Court who will swing the third branch of government rightward as well. A Message from 1st District? In Democratic stronghold cities like Baltimore, activists can ponder yesterday by looking outside to the states that voted “red.” But they can also look closer to home at places like the 1st District, where the majority voted for Republican Gov. Larry Hogan in 2014. Democrat Zeke Cohen definitively won the district yesterday with 66.5% of the vote. But 33% of the voters there supported Cohen’s Republican opponent, Matt McDaniel, whose public safety message drew criticism with his call for video surveillance to detect criminals at the district’s borders. Speaking with The Brew yesterday, McDaniel said that his critics “misunderstood” his video surveillance idea when they saw a racist message behind it. Likewise, McDaniel said he knew nothing about the mailers that showed up at some 1st District households depicting Cohen walking with protesters in the wake of last year’s death-in-police custody of Freddie Gray. The mailer accused Cohen of “poor leadership,” said he should have called for “law and order,” and showed a photo from the April 27 , 2015 rioting of young black men trashing a police car. 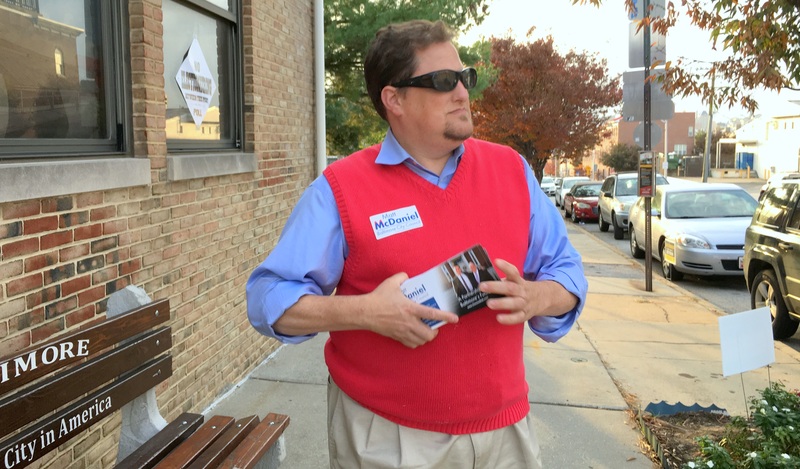 Speaking yesterday as voters streamed in and out of the polling station at the Hatton Center on Fait Avenue, McDaniel sought to frame his candidacy differently. Asked yesterday if he supported or rejected Donald Trump, McDaniel grimaced and refused to say. Amanda Parker, a 39-year-old massage therapist who also voted yesterday at the Hatton Center, said she did not ultimately cast her vote for Trump. But Parker also said she had a hard time voting for an insider like Clinton. “Someone new, not a politician, might be better,” she said she also felt. Health care is another area where she sees Americans losing ground. “In just the last month, I’ve had so many people I know say, ‘My health care costs just doubled!’” she said. She worries that a Trump presidency could lead to more guns on the streets and in homes and to dangerous wars, but she worries about sticking with the status quo. “I just want better health care and I want some peace,” said Parker, who compared her feelings about the last election to this year’s.